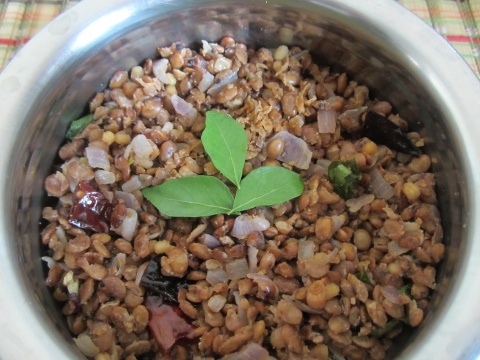 Kollu Sundal Recipe, today we will learn how to prepare kollu sundal with step by step photos. This simple and easy to prepare south indian style salad / sundal is not only healthy but works great for people trying to reduce weight. Kollu / Horse Gram / Kulthi is a nutritious bean rich in calcium, iron and protein. They are considered to be very helpful to people trying to reduce weight as it is rich in fiber. We prepare rasam / soup, sundal and chutney with kollu. Kollu tends to increase heat inside our body which in turn helps to burn fat. Pregnant ladies should avoid this. Kollu is pressure cooked with water, the cooked water or chaaru can be used to prepare curry or rasam / soup. Cooked kollu is used to prepare sundal or can be used to prepare curry or kurma. This is a simple sundal recipe where I have only onion and chilies. You can give a twist by adding grated coconut and chopped raw mango. I have shared 5 kollu based recipes, Kollu Podi, Kollu Chutney, Kollu Rasam and Kollu Kurma Kuzhambu. If you try any of my recipes, then do share your feedback with us. Pressure cook kollu with 4 cup water for 10 whistles and remove from the heat. Keep the kollu separately and use the water for preparing kollu rasam. Heat oil in a kadhai and temper mustard seeds. Add curry leaves, urad dal, dry red chillies and chopped onions. Saute a while and add cooked kollu. Add salt to taste, asofeotida and cook for 5-8 mins.Serve hot or cold.